Dental fillings are material substances used to restore the integrity, morphology, and missing, decayed or cracked teeth. There are several types of dental fillings available in the market today. Gold fillings (elsewhere referred to as an inlay ostensibly because they cover either a third of the tooth or less) are popular dental fillings owing to their durability. 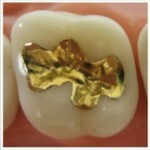 There are two forms of gold fillings: gold foil and gold cast fillings. Though expensive compared to other types of dental fillings, they are more appealing to the eye and do not tan or corrode. Gold fillings are not pure gold per se but a mixture of gold (roughly 75%) and other metals such as silver, platinum and copper (comprising the other 25%). The one problem with gold fillings is the fact that they are not easy to fit and will require you to make several visits to your dentist for proper fitting. 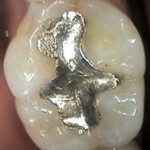 Silver is another type of dental filling though cheaper than gold. Mostly, it comes in form of an amalgam of mercury, copper and tin. Silver fillings are strong enough to enable you chew on things without them coming out. They are commonly used to seal cracked teeth especially the molars. Apart from their relatively high durability, they harden quickly, hence popular even among children. 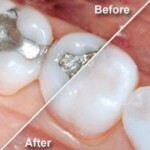 The downside of silver amalgam is the fact they do not resemble the natural teeth hence easily noticeable. They also eat up more of the natural teeth space during filling, not to mention that they tend to expand and contract inordinately. This cause cracks to widen further, requiring future fillings to be done. These are fillings that closest resemble the natural color of teeth-white. 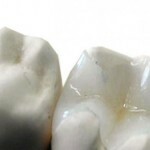 Composite dental fillings are made of several materials such as glass, quartz, and resin among other elements. Although composite dental fillings are not as durable, they have one advantage over other fillings-they have a more aesthetic finish, completely indistinguishable from the normal teeth. They do not come cheap though; you may be required to cough more than you would pay for silver amalgam. 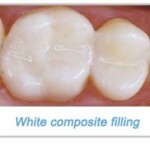 Ceramic or Porcelain dental fillings come in to forms: inlays and onlays. The former implies the filling will cover a third of the tooth while the latter implies the filling covers more than a third of the surface of the tooth. Ceramic fillings are long lasting, though they tend to get rough when they come into contact with other teeth. They are however beautiful to look at. They do not stain easily and are resistant to scratches. If you are seeking strength, durability and that elusive natural appearance, ceramic dental fillings are the best. lass ionomers are made of glass and acrylic and modified with other materials like resin. They contain fluoride (active component is known as fluoroaluminosilicate), hence a good choice for children as their teeth are still developing. The downside with glass ionomers is that they do not last long-usually less than 5 years. They wear out fast or simply break and also do not exactly resemble the real teeth compared to composite resin fillings. In view of the above, you may need to evaluate which is suitable for you based on cost, durability, aesthetics and the long term implications.